Xiaomi’s Mi Band has been a successful fitness tracker lineup from the company and is one of the best-selling wearable devices globally. The most recent iteration in the series — Mi Band 3, has also been widely successful. Now, the company is focused on launching its successor — Mi Band 4. Recently, David Cui, CFO at Huami, a sub-brand of Huawei that makes wearable devices, confirmed that the successor of the Mi Band 3 will be launched this year. While he denied imminent launch of the Mi Band 3 successor, the upcoming fitness tracker has now been certified by the Bluetooth Special Interest Group (SIG). Two models of the fitness band have been certified — XMSH08HM and XMSH07HM. While one will be the Mi Band 4, the other one will be the Mi Band 4 NFC. 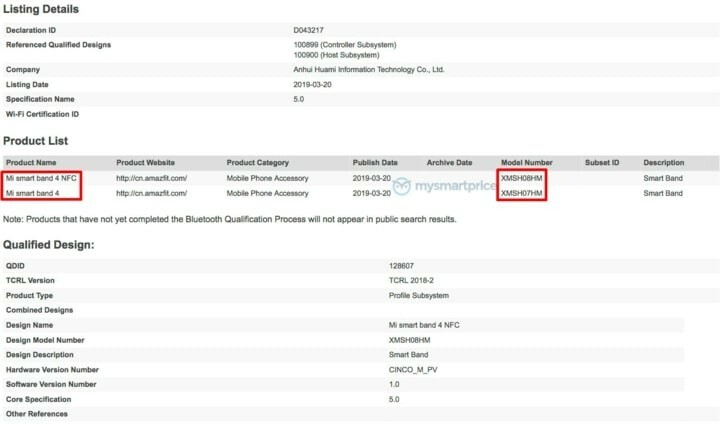 The certification process confirms that the upcoming fitness tracker from Xiaomi will come with support for Bluetooth 5.0 Low Energy standard. To remind you, the current Mi Band 3 supports Bluetooth 4.2 LE, so the upcoming Band will be a decent upgrade. Currently, nothing more is known about this fitness tracker, so we’ll have to wait for some time before details about the wearable device start emerging online. However, we can bet that it will come with several features and improvements, as has been the case with all the next-gen fitness trackers launched by the company so far. We also expect the device to be priced competitively — one of the major factors behind the success of the Mi Band series. The Mi Band 3 is currently available for purchase in India for Rs. 1,999.